Ah, Kyoto: the land of cherry blossoms, blushing maiko and enough photo opportunities to have your camera weeping a single tear as you snap yet another totally Insta-worthy shot. When most of us think of visiting Japan, it’s Kyoto we envision. Sipping freshly made matcha tea by a river, exploring one of the many World Heritage temples that make Kyoto the cultural capital of Japan and wandering through the stunning Gion district are only the beginning when it comes to the beauty Kyoto has to offer. But with so many options at your fingertips, how do you even begin planning a Kyoto trip to remember? 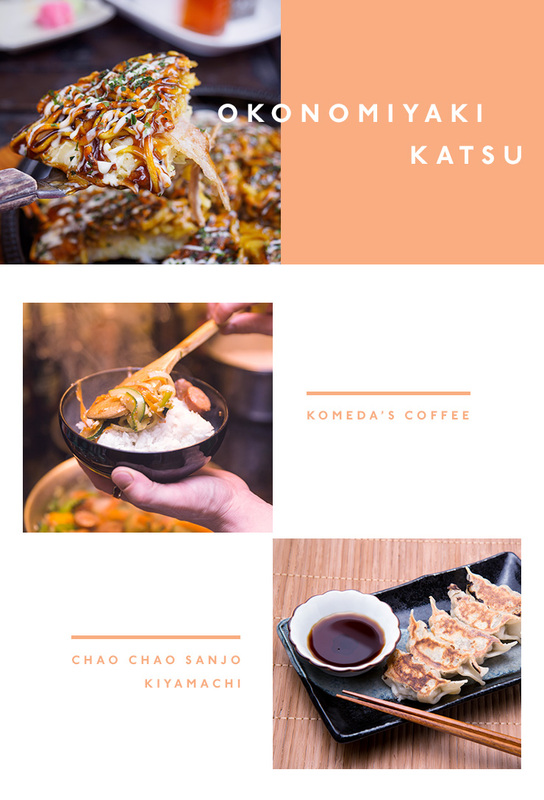 Fear not, poor citizen, for we are here with the ultimate guide to what to eat, see and do in Kyoto. Trust us, when we’re done with you, you’ll be as in love with Kyoto as we are and we are so not sorry about that. Bringing all the comfort of home with a Japanese twist, Soup Stock Tokyo is a warm hug in a restaurant for weary travellers. Specialising in all types of curry and soup, the Soup Stock soup-and-side set will cost you under a tenner and provides a tasty, filling mean with the accompanying rice or bread choices. Our recommendations? The vegetarian Italian tomato minestrone soup is literally heaven in a cup, while the cauliflower keema curry more than hits the spot after a day of adventuring. Rumour has it that Soup Stock also serves up a pretty killer butter chicken, just in case you’re missing the time honoured tradition of takeaway Friday. Go on, treat yo’ self. While the façade of this café-restaurant-combo tucked away on the side of the Aeon Mall Kyoto is not particularly impressive, Komeda’s menu holds more than a few options that may low-key blow your mind. The boneless fried chicken is sure to sate any appetite and is the perfect gateway into the magical world of Japanese fried chicken. Oh boy, the Japanese know how to do fried chicken right. Sandwich lovers will be spoilt for choice when it comes to topping selection (five words: miso fried pork cutlet sandwich) while those of you with a sweet tooth are about to encounter Shiro-Noir, a house-made Danish topped with soft serve ice cream and sweet syrup. Be still our beating hearts. Chao Chao Sanjo Kiyamachi, located on the edges of the insanely photogenic Gion district, is both an office favourite and a local secret—so you know it has to be pretty dang good. Specialising in soft, juicy gyoza, Chao Chao Sanjo Kiyamachi has informally won the title of best gyoza in Japan for a very good reason. We’re talking pizza gyoza topped with tomato sauce and mozzarella cheese, the famous fried pork gyoza and the mouth-watering mackerel and pork combination gyoza. But let’s not forget the real king of Chao Chao’s menu: the fried chicken gyoza. Yeah, you’re definitely going to need those extra stretchy fat pants for this one, friends. If you’ve never tried okonomiyaki, you’re not living. The fabled “Japanese pizza” is everything that makes Japanese cuisine so enticing: savoury vegetables, tangy mayo, your meat of choice, all grilled into a delicious pancake-shaped dish of awesome. Sounds pretty good, right? Well Okonomiyaki Katsu takes that already pretty sweet base and takes it to a whole new, mouth-watering level. Located in a scenic residential neighbourhood, this tiny restaurant is owned and run by the most lovable Japanese couple you’ll ever encounter. If you’re planning a trip to Kyoto, you’ve probably got Ginkakuji (known as The Silver Pavilion in English) and Kinkakuji (The Golden Pavilion), Ginkakuji’s arguably more famous sibling, on your itinerary. While the pavilion is definitely worth the trip, it’s in the garden department where Ginkakuji really shines. We’re talking bamboo groves, permanently-orange trees and moss-covered stone bridges straight out of a Ghibli movie. Take your time wandering around the precinct and soak up all of the Zen feels. Ah Japan, we love you. Atop the bustling Gion district lies a temple that should be high on any Kyoto itinerary. Nestled on the edge of lush mountains, the main hall of Kiyomizu-dera was built entirely without nails and offers breathtaking views over the entire city of Kyoto. The temple is nearly 1200-years-old and is a UNESCO World Heritage Site, so you know it has to be pretty impressive. Soaring orange pagodas in the typical Japanese architectural style greet you as you approach the temple precinct, but the real stunner is the walk through the mountains. Don’t forget to drink from one of the three separate streams of Otowa Waterfall; each stream symbolises longevity, success at school or a fortunate love life, but you can’t pick more than one or you risk the wrath of the divine. Sightseeing is serious business, guys. Informally known as the land of a billion orange tori gates, Fushimi Inari-taisha is the image that comes to mind when most of us think of visiting Kyoto. The largest shrine of Inari, the god of fertility and foxes, in Japan, Fushimi Inari is a hiker’s dream: the shrine itself sits at the bottom of a mountain (also called Inari) and the trek to the top, which takes about two hours, is completely lined with tori gates. Most tourists only venture to the first level, so the higher you go the more of the shrine you’re likely to get to yourself, which means the more peaceful it becomes. Plus, the view from the top over Kyoto is pretty spectacular. Just promise you’ll keep an eye out for the myriad of cats that live in the shrine and surrounding countryside. The chance of spotting a kitten is so worth the walk. History nerds, this one’s for you. Built in 1603 (it’s older than Australia as a country, guys) as the Kyoto residence of Tokugawa Ieyasu, the first shogun of the iconic Edo Period, Nijo Castle is considered one of the best surviving examples of castle palace architecture from Japan’s formative feudal era. The castle itself is divided into three main circles, with gardens, stone walls and moats spread throughout the complex. Don’t miss out on the opportunity to see real life nightingale floors, which squeak when stepped upon in order to warn the residents of intruders, at Ninomaru Palace within the secondary circle of defence. If you’re ready to live out your dreams of being a ninja or samurai, Nijo Castle is the place to do it. Yes, it’s cheesy, yes you’ll feel like a cringey tourist but getting dressed up at least once in your time in Kyoto will add a whole new level of cultural immersion to your trip. Plus, it’s just a hootin’ good time. Kimono hire shops dot Kyoto, rivalling even 7-11 in population, and the best shops will offer you a choice between the 12-layer and super laborious kimono or the summer-friendly yukata. Our recommendation? Go with the yukata, your back will thank you. Choose a hire shop somewhere close to Gion and go full tourist as you wander the old-school laneways in your very own Japanese get-up. At the very least it makes for some great selfie opportunities. Just remember to tag us in your Instagram photos before the fame goes to your head. 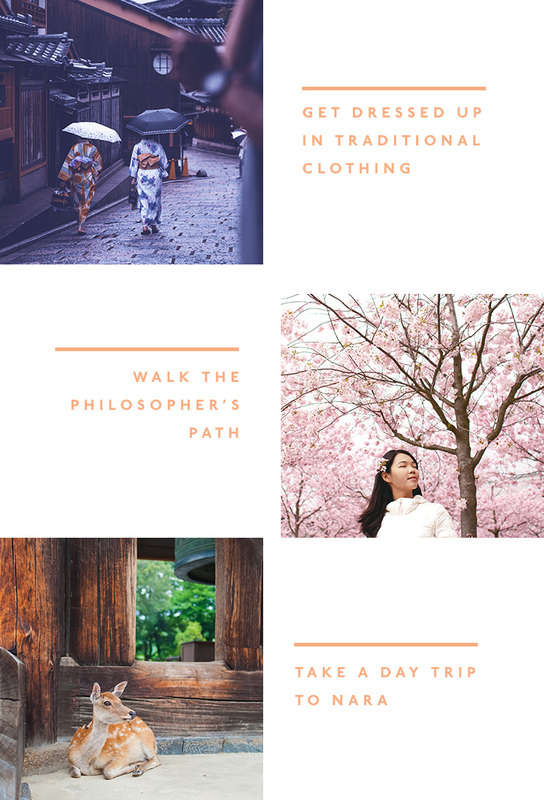 We know we’ve talked a lot about Gion in this guide (because it’s low-key the best part of Kyoto and you can’t convince us otherwise) but what we haven’t mentioned is the shopping. The SHOPPING, guys. We’re talking everything from traditional crafts like tiny blown glass miniatures to hand painted silk fans to enough flavours of soft-serve ice cream to sate any appetite—and that’s even before you get to the big sights. Catch the bus from Kyoto Station and start your journey street-side, which allows you to wander the cobblestone laneways and dart in and out of the shops as you please. Finish the shopping trip by heading up to Kiyomizu-dera for those sweet, sweet views. Psh, who said shopping couldn’t be a cultural experience? Featuring a bubbling canal and overhanging cherry trees, this two-kilometre-long path links Ginkakuji to the equally famous Nanzenji Temple, one of the most important Zen temples in all of Japan. Made famous by Japanese philosopher Nishida Kitaro, who supposedly practiced meditation while walking this route on his daily commute to Kyoto University, now the Philosopher’s Path is a popular cherry-blossom viewing spot for the locals. It’s also a pretty sweet location to grab a bite to eat at one of the many cafes and restaurants dotting the route on your way between sights. Okay, we know that Nara is not technically in Kyoto but wandering around this temple-town only a short train-trip away is a definite must-do on any Japanese itinerary. You probably have heard of Nara from the billion deer photos floating around on every social media channel (we may be guilty of posting a few ourselves) but there is more to his quaint town than fluffy deer booties. 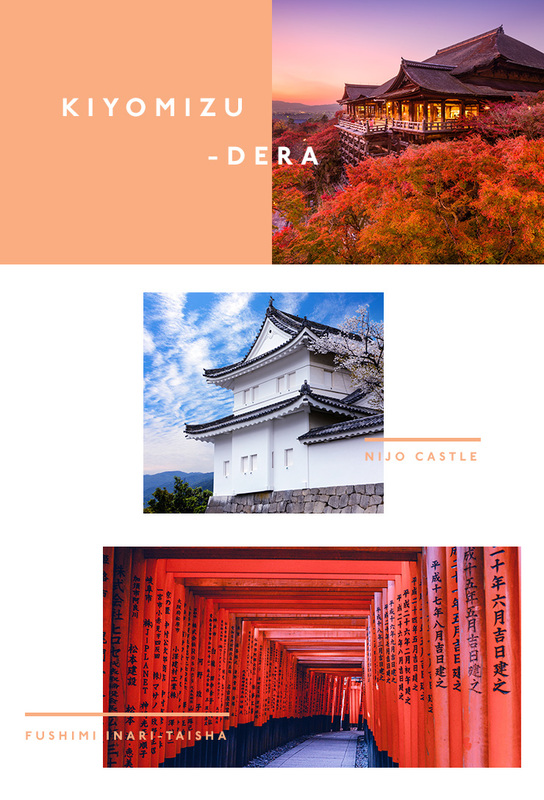 Nara was actually the first permanent capital in Japan and as such is home to some of Japan’s oldest and largest temples, including Todaiji Temple which contains one of Japan’s largest bronze statues of Buddha. Other attractions include Isuien Garden, a stunning example of a traditional Japanese garden, and Horyuji Temple, featuring the world’s oldest wooden buildings. Oh and did we mention the massive population of wild, Bambi-esque deer just casually roaming Nara. Don’t mind us; we’re just packing our bags. We’ll see you at the airport, guys! Itching for more travel inspiration closer to home? Here’s how to score discounts on the best things to do in Queensland.